Our oceans are on the brink of collapse. Threats from overfishing, climate change, and pollution are putting marine life under immense strain. Instead of just talking about it, the James Beard Foundation is doing something about it with their restaurant-focused Smart Catch program for chefs and run by chefs. The organization is best known for its annual awards likened to the Oscars of the culinary world, and for hosting prestigious James Beard House dinners, but they also lead Impact Programs like Chefs Bootcamp, Food Waste Curriculum, and the Smart Catch Program. With ocean peril in mind, the James Beard Foundation addresses sustainability at the restaurant level, starting conversations so diners vary their diets beyond popular species and chefs alter their menus by sourcing underutilized species. Chef Nick Leahy’s restaurants AIX and Tin Tin are part of the Smart Catch Program with the purpose of increasing the sustainability of the seafood supply chain. Smart Catch trains and provides support to chefs so they can serve seafood fished or farmed in environmentally responsible ways. On Tuesday, April 9 he hosted Friends of James Beard Foundation Dinner in support of JBF Impact Programs. The multi-course dinner focused around green listed seafood items, those best choice rated items outlined by Seafood Watch. A JBF representative attending the dinner welcomed diners and introduced suppliers for the evening: Inland Seafood, Cheney Brothers, and Halpern’s. “Suppliers are everything,” she said. To start, Leahy’s Tin Tin brought oysters prepared two ways. Eastern oysters from Virginia were roasted, blow torched for caramelization and bathed in melted foie compound butter. Gulf Coast Turleback oysters from Portersville Bay, Alabama were served on the half shell. 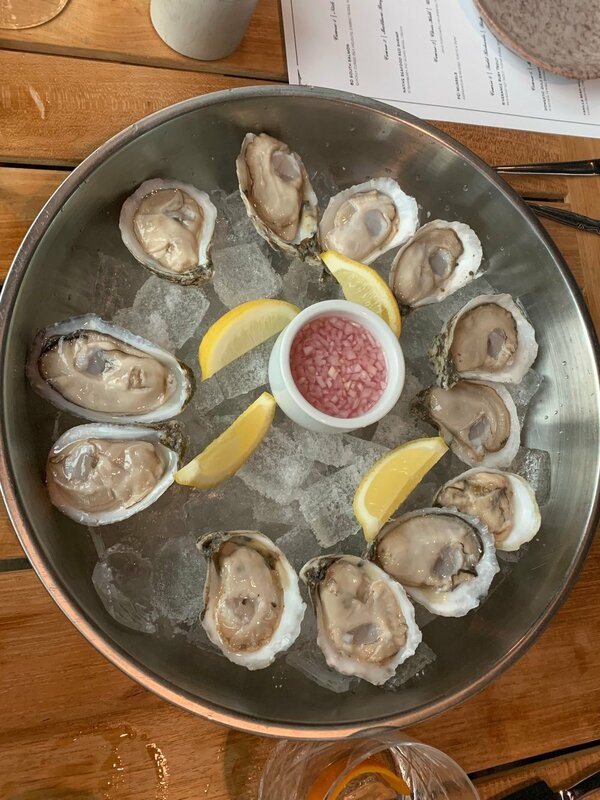 The moderately deep cups held plump, meaty and fresh oysters with fresh, briny salinity. Course one celebrated 60 South salmon farmed in the deep blue, cold waters of the Antarctic. Chef Nick Leahy quickly cured the fillets which are sustainably raised without hormones or antibiotics in floating farms in 60 South’s remote outpost. Richly flavored, they didn’t necessarily need accouterments. Leahy served them atop a silky pea veloute and carrot puree with fresh and crisp minty peas. Course two was all about the crowned jewel of Alabama, Royal Red shrimp from Native Seafood. Canoe’s Matthew Basford served them with pickled with ginger, rice wine vinegar and Sichuan pickled strawberries. Candied kumquats and pistachios browned in butter and shrimp oil provided a textural element. The large, distinct, crimson colored shrimp had an almost lobster flavor. Course three presented renowned PEI mussels. The Prince Edward Island beauties are sustainably raised in clean water and grown on collector ropes suspended in the ocean. The process is all-natural, with seed collected in the wild. Local Three’s Chris Hall served them cacao e pepe style with lots of black pepper, cheese toiles, and slivers of asparagus. Course four featured Riverence Trout, steelhead responsibly farmed in the Snake River in Idaho. The river is fed by spring water from the Rocky Mountains. Chef Todd Richards of Richard’s Southern Fried pan roasted the fillets and served them over a turnip puree with smoked apple jus and bits of peppery arugula. He noted that “sustainability comes in many forms,” and talked with guests about changing supply chains, most notably with fish being flown back and forth for certification/grading. Course five came via Matt Ridgeway of Cooks and Soldiers. Long line and hook caught Gulf snapper was steamed and served with a fennel Basquaise, jicama, and duckfat dumplings with sofrito. It was like a Thai-Spanish dashi that you wanted to sip with a spoon. AIX’s pastry chef, Kendall Baez, has a love of pastry cream and puff pastry. Her sustainability feature was two fold. Her vanilla bean mille feuille was made with Day Spring Farms flour. The USDA certified organic wheat is grown, cleaned, and milled fresh on site in Danielsville, GA. A quenelle of vanilla bean ice cream was plated next to an almond granite and two tiny rhubarb clouds. Trout roe dotted the top. At the close of the evening one guest won a Big Green Egg generously donated to the cause by BGE. AIX. 956 Brady Ave. NW, Atlanta. 770-838-3501, aixatl.com.